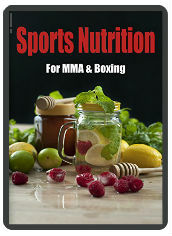 All things MMA Nutrition related, including this free ebook. See our whey protein overview to answer all the common questions in regards to this supplement. MMA Nutrition should not be all protein shakes and supplements. Look beyond the time-window before, during and after training and ensure that you consume a whole food diet with plenty of organic fruit and vegetables. Supplements such as creatine, protein powder, MSM and curcumin definitely have their place but remember to build a strong foundation with a good base of healthy, wholesome foods.